This week I discovered Newton’s Nook Designs. They make some of the cutest and quirkiest stamps I’ve seen so far on my crafting journey. My middle name is Brie (for real!) and when I discovered the Just Say Cheese stamp set I just about died. The set is filled with adorable cheese themed designs, including a “Brie Mine” sentiment. I’ve been wanting to get into card challenges for a while but have been reluctant because I’m quite shy. I feel like I fit in over Newton’s Nook so I thought, why not? And here we are…Inky Paws Challenge #11 – Citrus Colors. The challenge was to use bold citrus colours: lime green, lemon yellow, orange, and grapefruit pink. My card, below, is simple and fresh. Perfect for summer! Inky Paws Challenge #11 – Citrus Colors using the Sunflower Freebie. I don’t own any Newton’s Nook Design sets (yet!) so I downloaded the Sunflower freebie and imported it into Silhouette Studio. I traced the sunflower and removed the area that had the ladybug. When I originally sketched my card, I planned to use the ladybug, but once the card was assembled, I didn’t end up using it. I had to extend some petals and the centre circle to fill in the area where I removed the ladybug but this was easy enough because the pattern was pretty symmetrical. I was able to duplicate and mirror the parts I needed and then place them manually. I used orange and grapefruit pink for the flower petals, backed on some lime green patterned paper (from the 6X6 Lawn Fawn, Daphne’s Closet pad). I used some Bazzill Basics Dotted Swiss Cardstock in Rope Swing for the flower centres. You can’t really see in the photos, but there are tiny circles cut, just like on the original Newton’s Nook image. 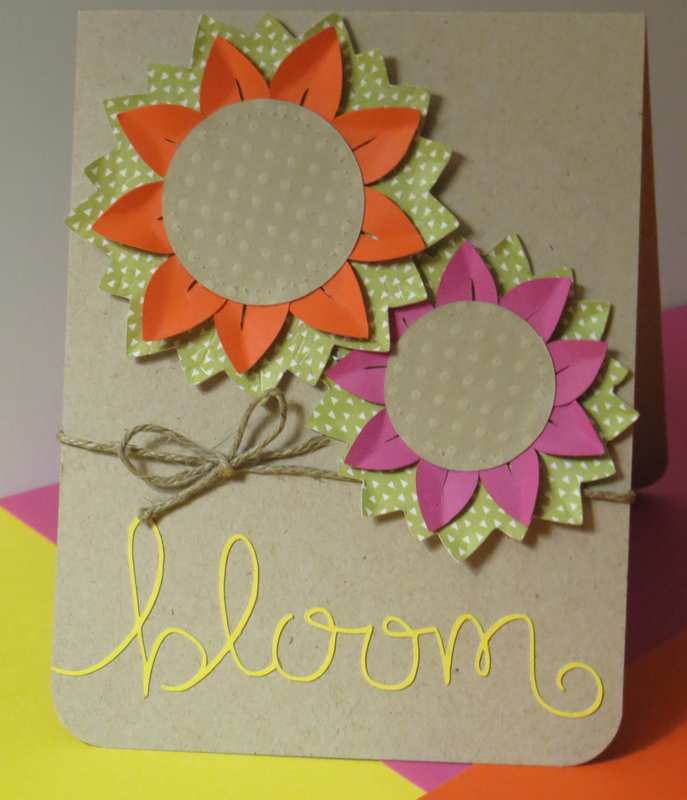 Finally, I traced and cut the bloom sentiment using yellow cardstock. To assemble the card, I started with the flowers by adhering the petals to the back of the centres and bent the petal edges inward using my finger nail. I then adhered the flowers to the lime green leaves. I adhered the smaller of the two flowers to my A2 (4¼” x 5½”) craft card base using my tape runner, and then adhered the larger flower using foam tape to add some dimension. I applied the word using modest amounts of my Zig 2 Way Glue Pen on the backside of the sentiment. Finally, I used some twine and tied a simple bow and rounded the bottom corners. Thanks to Newton’s Nook for the opportunity to participate in this fun summertime challenge. Since I am a “new” crafter, I thought I would go through some of the basics that I’ve learned so far. Take all this with a grain of salt. Everyone likes to organize themselves differently, and even more than that, everyone has their own favourites. These are my favourite, or most used supplies so far on my crafting journey. This list may change with time as I discover new techniques, styles, and products. Cardstock. I have a few go-to cardstocks. I typically buy the Reflections (Michael’s) brand 8½ x 11 fifty page packs of cardstock. I binge buy the packs when they are on sale 2-for-1 to stock up. I also love Bazzill Dotted Swiss Cardstock (also from Michael’s). The Bazzill Dotted cardstocks come in a variety of colours to compliment most projects. I don’t have an embossing machine (Cuttlebug, Big Shot) so this paper is a great way for me to add texture to my projects. Adhesive. Depending on the project, I use a variety of adhesives. Most often, I use a permanent tape runner, a Zig 2-Way glue pen, with chisel tip, Glue Dots, ek Tools 1¼” double-sided tape, and Tombow Mono Multi Glue. Adhesive might seem like a small detail, but it can make all the difference when assembling your project. I recommend trying out different options and using what works best for you. Check the craft, office, and hardware sections of your local stores to see the plethora of options available. I’m still exploring the world of adhesive so this list might change with time. Mounting foam. I know that technically, mounting foam is an adhesive but I go through so much it deserved a category of its own. When I first started, I used the sheets of circles, squares, and rectangles that are readily available. I found these kind of inconvenient and finicky. Then, I discovered 3M mounting tape. I love that I can cut (or tear) to any size I need and how easy the backing comes off the strips. There is a clear version but I don’t love it because it’s so sticky that I find it hard to use. Inks. My go-to and must have ink for heat embossing is VersaMark. I use baby wipes for cleaning my stamps and tools after using any ink. Embossing. My favourite all-around embossing powder is the Ranger Super Fine Clear. Silhouette. I own a Silhouette Portrait electronic cutting machine. This machine has changed my life! When I really started getting into card making as a hobby, I found the idea of punches and dies too expensive. A little research and I realized that if I thought I would buy 10 or more punches or dies (uh…yes!) then an electronic cutting machine would pay for itself pretty quickly. 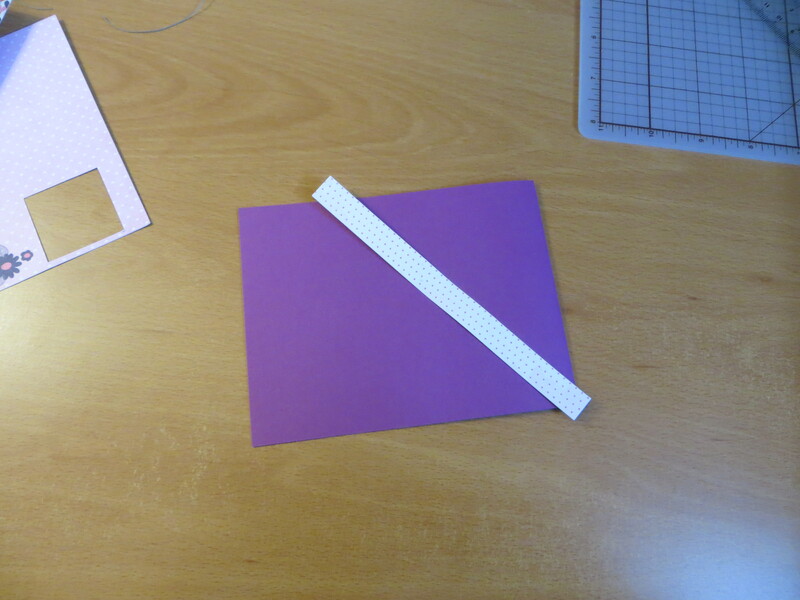 I can cut any shape to any size on any kind of paper as many times as I need. Yes, it’s more expensive upfront, but the versatility of what it can cut means that within just months I’ve saved a ton!! The creative options are endless and my Silhouette is the best craft purchase I have made to date. Trimmer. I use my Fiskars paper trimmer on almost every project. I keep a supply of blades on hand and replace them when they start to dull. If I’m able, I always try to purchase from Canadian retailers. My favourite one is Scrapbooks by Design. They have a good selection of current product at prices comparable to the US giants and shipping is inexpensive. Love them! I subscribe to the Simon Says Stamp monthly kit. I like how the kit inspires creativity and includes products I might not otherwise try.